Hana Kapetanovic in World Affairs on 7 May, 2017. Simultaneous chants of ‘freedom’, ‘liberté’ and ‘hurriya’ could be heard on Sunday in Beirut at the Workers’ Day March, a testament to the trilingual youth of Beirut. Young people in the Lebanese capital speak other languages too but these are often overlooked, like the people who speak them. These are the languages of migrant workers that wove through the march alongside the English, French and Arabic. 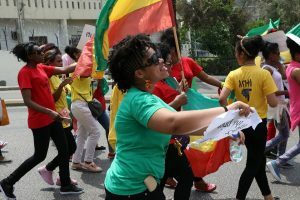 The march was organised by migrant domestic workers with the support of Lebanese NGOs and aimed to shed light on the issues they face as well as to demand their rights. Of course, it had to be held the Sunday before May Day as it’s back to work for most on the day itself, if they even had a day off at all. Those in a slightly more privileged position were able to hold a march on May Day, but for many migrant workers missing work is not an option. Instead, on Sunday, for the eighth year in a row they marched, and for the eighth year in a row significant improvements to the situation have not been seen. Instead, the situation appears to be getting worse. December saw the deportation of two important voices in the struggle for migrant domestic worker’s rights, Sujana Rana and Rose Limbu, and the following months have seen the continuation of abuses, deportations, detentions and deaths. 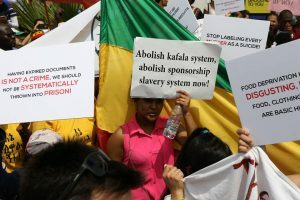 The three main demands of the march were to abolish the kafala system, to ratify and implement the ILO Domestic Workers Convention of 2011 (C189) and to stop state violence against migrant workers. The kafala system, or the sponsorship system, is the crux of the problem and exists in much of the Arab world. 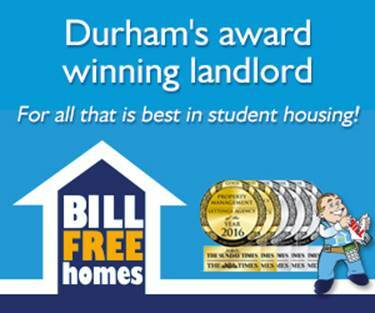 It is a system under which migrant workers, mainly in the fields of construction and domestic work, are employed. A kafeel, or sponsor, in the new country pays for and arranges the worker’s flights, visa and other fees in exchange for their work. This means that the sponsor has complete control over the worker, often taking away their passport; and ‘escaping’, also known as quitting their job, carries heavy consequences for the worker. As migrant workers are not included with other workers in the Lebanese labour law, they do not have the same basic rights such as the minimum wage, maximum hours of work, a guaranteed day off or the right to terminate their contract. Instead, their labour rights are governed by the contracts they sign with their employers, which are rarely respected. The conditions of migrant workers in the Arab world have begun to feature frequently in the news, in large part due to Qatar’s 2022 FIFA World Cup bid – the only time I have ever thanked football for anything. The infrastructure project has been mired with accusations of poor working conditions, exploitation, forced labour and withheld salaries. The summer of 2013, the death rate for Nepalese workers was almost one a day on the project. As for domestic workers, a video recently went viral of a worker in Kuwait falling off a balcony, filmed coldly by her employer. It was immediately assumed that she was trying to commit suicide, but, after surviving the fall, she has spoken out to say that her employer was trying to kill her. This is not unique to Kuwait; it is the story of many domestic workers in Lebanon. They end up in hospital or dead after ‘falling from their balcony’ – always a ‘suicide’, never an investigation warranted. Statistics about this, of course, are hard to come by. There are few police reports, few investigations and not enough people that care. Even if they are really suicides, they are occurring at alarming rates. Any unexplained death deserves investigation; any death at all deserves some dignity. On Sunday, domestic workers could be seen on such balconies in far happier dispositions, cheering on the march, sometimes with their employers beside them. 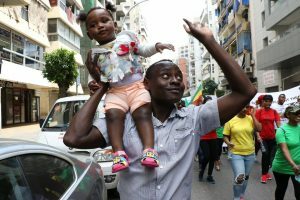 Although the march carried a heavy and important message and uncertainty about the future, it ended with dancing, laughter and the music of their home countries. It was, after all, their day off.